A new space has opened up on UBC’s Okanagan campus that will help level the academic playing field for students with disabilities. The new Inclusive Technology Lab (ITL), located just inside the main doors of the library, has assistive technology that can help students with specific needs. Currently, there are 369 students registered with the campus’s Disability Resource Centre (DRC), a service centre for students, faculty, and staff that improves educational equity for students with a disability, illness, or where injury limits their functioning in an educational setting. Students registered with the DRC, and also those interested in learning more about assistive technology, can access the new lab to use the assistive software, try out the ergonomic workspaces, or study in a distraction-reduced space, says Barbara Sobol, undergraduate services librarian at UBC Okanagan. While the DRC does have a computer workstation with assistive technology installed, the office is only open during regular business hours, limiting the time that it can be used by students. The new ITL is open during regular library hours; early in the morning until late each evening. And Sobol explains there are many uses for the space — not only is it being used by DRC registered students, it can also be used by those who are recovering from a temporary injury, and it is a place where all students can learn about the many aspects of assistive technology. While assistive technology is often associated with support for students with visual, hearing, or physical disabilities, increasingly this technology is being used to support students with neurological disabilities, including brain injuries, autism, mental illness, ADHD, and other learning disabilities. Examples of assistive technology can be an ergonomic mouse, a digital magnifier for a monitor or computer screen, and software that allows the user to operate a computer with voice commands. Along with the installed equipment, like stationary computer desks, the ITL also provides equipment that can be loaned and taken home. This allows the students to have flexibility in workspace options and gives them an opportunity to try out technology options and determine their preferences. Sobol notes that funding for the lab was made possible by two anonymous donors, a private B.C.-based foundation, and a couple of UBC alumni. This was part of UBC’s start an evolution campaign, which recently closed having surpassed its $100,000,000 goal raised in the Okanagan. 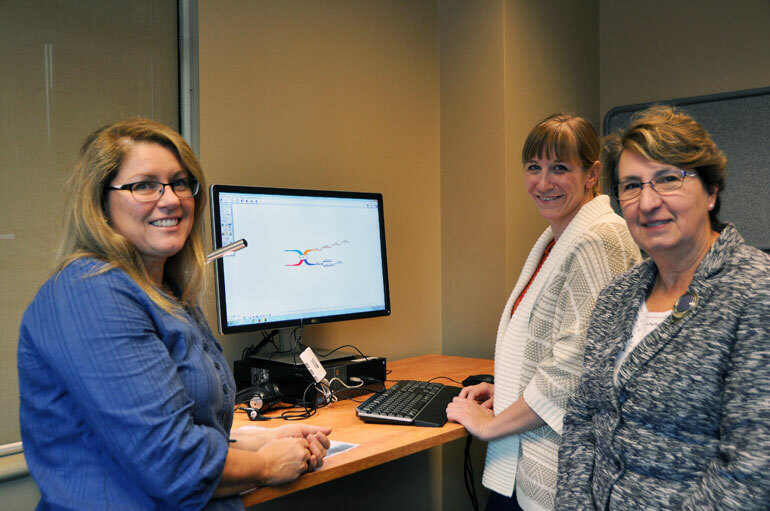 Earllene Roberts, with UBC Okanagan’s Disability Resource Centre, and Barbara Sobol, undergraduate services librarian, demonstrate some of the equipment available at the campus’s new Inclusive Technology Lab to Provost and Vice-Principal Academic of the Okanagan campus Cynthia Mathieson (right).